Tnvestors shed safe-haven assets such as gold and government bonds while oil prices plummeted on Monday on expectations that the weekend’s missile attacks on Syria would not mark the start of greater Western involvement in the conflict there. 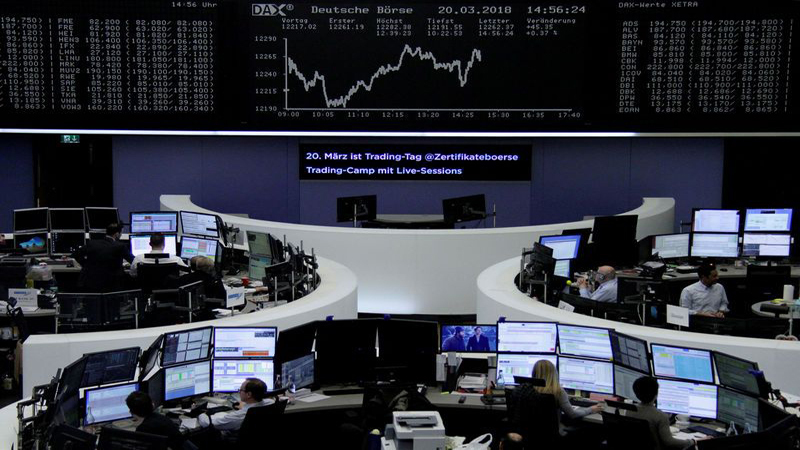 European shares were broadly flat, however, adding to a mixed picture in Asian stock markets and suggesting that a degree of caution still prevails. “There is some relief that a direct confrontation between the US and Russia over Syria has been avoided,” said DZ Bank rate strategist Daniel Lenz, after Russian President Vladimir Putin warned on Sunday that further Western attacks in Syria would bring chaos to world affairs. Saturday’s strikes marked the biggest intervention by Western countries against Syrian President Bashar al-Assad and his ally Russia, which is facing further economic sanctions over its role in the conflict there. The United States, Britain and France said the missile strikes targeted Syria’s chemical weapons capabilities and were not aimed at toppling Assad or intervening in the civil war. US President Donald Trump tweeted “Mission accomplished” after the attack, underlining expectations that Western action would be limited. Gold prices fell a quarter of a percent to $1,341.51 an ounce while European and US government bond yields — which move inversely to prices — rose across the board. Yield on both German and US 10-year government bonds, seen as among the most liquid and safe assets in the world, were both at their highest level in three weeks. Oil prices meanwhile dropped sharply, with Brent crude LCOc1 shedding over 1.5 percent to $71.45 a barrel, though a rise in US drilling for new production also dragged on prices. MSCI’s world equity index, which tracks shares in 47 countries, was flat on the day and a pan-European stock index was marginally lower. US stock futures were pointing to a higher opening on Wall Street. That market is now focused on US first quarter earnings, especially after February’s sell-off and tech sector woes took valuations down to more reasonable levels, said Salman Ahmed, chief investment strategist at Lombard Odier Investment Managers.